Warning: This post is a fairly deep drill-down on a minor footnote in video game culture. If obscure Nintendo lore is not your thing, kindly move along and wait for a less niche post. One of the most insignificant video game characters ever has recently returned to my life: Undo Dog. He’s technically a Mario character, though only in the loosest sense of the expanded Marioverse. He first appeared in 1992’s Mario Paint, a sort of Nintendo approximate of Photoshop that came packed with the Super NES Mouse and allowed players to draw and paint images and create crude animations that couldn’t be uploaded or transferred off the game pack in any way. Mario-branded but not really all that Mario-specific, the game came out when I was only ten, and I loved it. And one of the things I loved most about it was Undo Dog, the game’s equivalent of CTRL+Z. 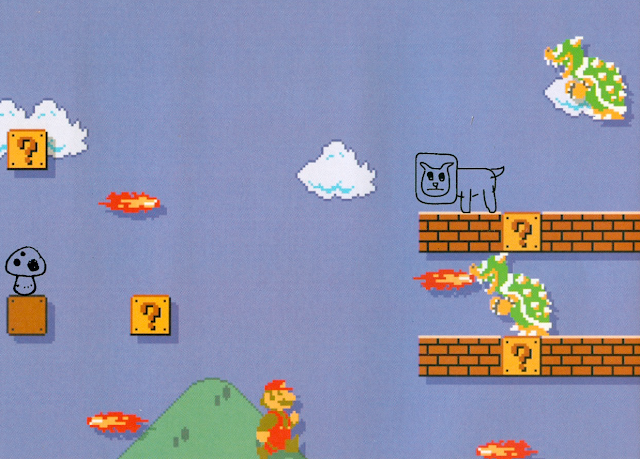 Even at ten years old, I was a sucker for anything canine, and the fact that Nintendo chose to imbue one of the most functional aspects of Mario Paint with a dog personality is a great example of why I am a lifelong Nintendo loyalist. And the fact that the icon border around Undo Dog’s face was revealed in his “dancing in the tool tray” animations to be a weird, square collar? I was in love — with the character design but also with whatever clever person who implemented it. I felt catered to — and that rarely happened when I was younger. Given my history on this blog writing about various Super Mario games, it shouldn’t surprise you that even back then, I had an encyclopedic knowledge of them. I knew everything that a North American fan could know, and I was a strong supporter of the series’ also-rans. When Super Mario Kart came out in September 1992, the only thing that seemed more pressing than beating the game on every conceivable level was dreaming up ideas for the inevitable sequel, and I sank hours into this task. I drew maps for tracks based on levels from Subcon, the setting of Super Mario Bros. 2, and Sarasaland, the setting for Super Mario Land, and handpicked the characters that would join the roster of Mario Kart racers. No lie: I even drew new versions of the Super Mario Kart box art that featured then-unknown characters like Princess Daisy (the ruler of Sarasaland and a character most players wouldn’t have recognized back in the day), Birdo (Super Mario Bros. 2’s Yoshi prototype, essentially, and also the most gender-complicated bipedal dinosaur in the history of video games) and Wario (the minor Super Mario Land 2 villain that no one cared about once upon a time). All of these characters eventually did become playable in later Mario Kart games, I should point out. However, my never-distributed, beyond-unofficial concept art also included characters like Pauline (the Donkey Kong damsel who has since been made to look like Sofia Vergara), Wart (the Super Mario Bros. 2 villain who has subsequently showed up as a Zelda character but never again as a Mario character) and an ultra-obscure Mario D-lister named Heavy Zed, who was in retrospect not a character in any way. Heavy Zed was a big, dumb owl that Mario would hop onto in Super Mario Land 2 and prompt him into waking up and fluttering in a single direction until Mario encountered a second Heavy Zed, which he’d then hop onto. Essentially, he was a platform lift, like the dolphins in Super Mario World, but ten-year-old me didn’t care: He had a name and therefore deserved realization as a playable Mario character. Yeah, I had some big ideas. Included on this wishlist was Undo Dog, just because he also had a name and I had seized on him as a thing worth paying attention to, and I drew him into my terrible mock Super Mario Kart 2 art, stockade collar and all. In retrospect, it seems silly and misguided in the way most fan fiction seems to anyone not at the heart of the subject matter’s core fandom. Time passed, and although I admit to being guilty of jotting out the occasional dream Mario Kart roster during my free moments — E. Gadd from Luigi’s Mansion! Dixie Kong! Captain Syrup! — I forgot about dumb ol’ Undo Dog. And then Super Mario Maker came out. For those who don’t know, Super Mario Maker is essentially the game that Mario Paint should have been, and it allows players to create their own Mario levels and then upload them to be enjoyed by others. Presentation-wise, the game owes a great debt to Mario Paint, and this includes the implementation of Undo Dog as the CTRL+Z function, twenty-three years after the fact. Here is a trailer to help you understand why Super Mario Maker is weird but great. But there’s an additional reason I’m writing about Undo Dog today. One of the more fan service-y aspects to Super Mario Maker is that its Super Mario Bros. mode includes the ability to “costume” Mario as various characters from other Mario games — Bowser, Dr. Mario, Rosalina, etc. — as well as characters from other franchises — Zelda from Zelda, for example, or Kirby from Kirby or even the Wii Balance Board from Wii Fit. This is remarkable is that it plays into the new Smash Bros. style Nintendo is applying to all its franchises, in which characters from games that have little in common get to interact. I mean, hell — Super Mario Maker allows you to sub in Ness from Earthbound, the squid-kid from Splatoon, Foreman Spike from Wrecking Crew and even Lottie the Otter, from and Animal Crossing game that hasn’t even been released yet. And mixed up into all this is Undo Dog. I’m not saying this makes Undo Dog a shoe-in for the next Mario Kart, exactly, but my inner ten-year-old is gratified to see the most minor of video game characters resurrected in my adult life, in a new age where Nintendo has gone Crisis on Infinite Earths with every game. I don’t think my placement of Daisy, Wario and Birdo in the Mario Kart karts was prescient, necessarily, but I’m currently placing more money on Undo Dog than I am on Heavy Zed, were that a bet to be made in some dank corner of the nerdy internet. And that is a surprising thing for a longtime video game fan to say, twenty-three years later, just like it was surprising to get a new Kid Icarus game after so many years and finally see a Super Mario Bros. 2-themed track in a Mario Kart game. Go Undo Dog, you sneezing marvel, you. May your video game career be long and unusual. I loved Mario Paint! And Undo Doggy! It was one of maybe 5 snes we owned. I think I was about eight or so when we started playing it. I think my favorite thing to do was go to the coloring book with yoshi and mario? I'd cut the head off of yoshi, flip it around and spray paint blood all over the screen. Hashtag: Weird SNES confessions? That and Sim City was my favorite. Dr. Wright's into music! And that Da Da duh dun! Music when you got your umpteenth park! I never knew he sneezed when the music wasn't playing. I always liked the music so much and the quiet was unsettling, so I never turned it off.